Flawlessly directed by Rob Sitch, this gem of a movie features a big dish (of the satellite kind), a big heart and some surprisingly big ideas. Memorable scenes abound; one of my favorites is when the U.S. 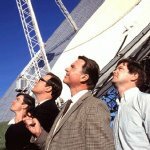 Ambassador visits the gigantic radio telescope in Parkes, New South Wales, at the crucial time it has lost all contact with the Lunar Lander. Not wanting to fess up to the situation, the four scientists (three Australians/one American sent by NASA) revert to deceiving their esteemed guest by having one pretend his is the voice of Neil Armstrong using a microphone in an adjacent part of the structure. The Ambassador leaves very happy and very impressed. "It sounded like he was in the next room!" he declares later to a crowded gathering of local dignitaries. But back at the ranch the pressure was building to unbearable proportions. Yes, Houston did have a problem. The one and only communication link to this truly epic event in recorded history was a satellite dish in rural Australia with a few bugs. And a few hundred sheep. The sheep may not have cared, but virtually all of mankind did. A small, but devout group of doubters still abound, questioning whether or not the moon landing was real or the result of an elaborate hoax of unprecedented proportions. Having said this, no one should doubt nor question whether or not this is one of THE best films on the shelves of your local video store. As Gary Thompson of the Philadelphia Daily News declared, THE DISH is "a movie of small steps that manages, in the end, to make a giant dramatic leap." It pleases me to see you so giddy. As the author of this blog it is my primary intention to bring joy to my readers. My uncharacteristic typo has clearly engendered more boisterous merriment in you than the entire Mt. Holyoke Glee Club could ever hope to muster.